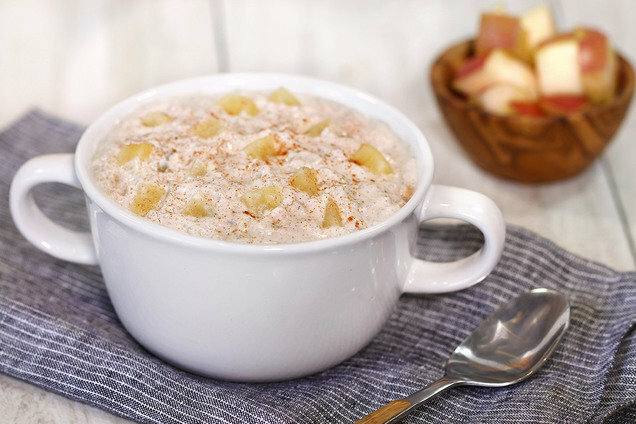 Want a cool and creamy breakfast with a hearty twist? These oats 'n yogurt bowls are just what you need! Here's a fresh spin on the pumpkin-spice trend. 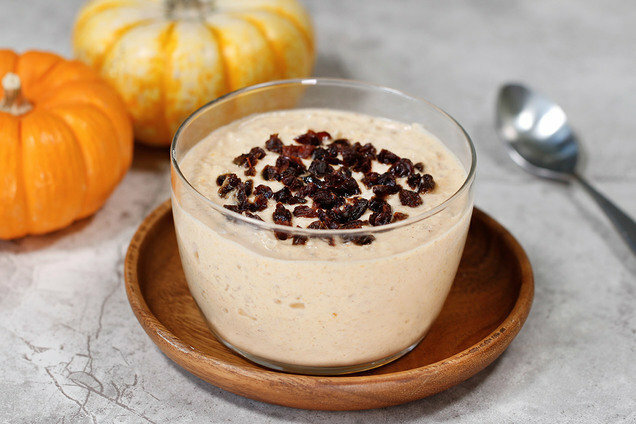 We predict you'll be making this incredible breakfast bowl long after PSL season ends! In a small pot, bring 3/4 cup water to a boil. Add oats and salt, and return to boil. Reduce to a low simmer. Cover and cook for 30 minutes, or until thickened. Let cool completely. Refrigerate until chilled, about 45 minutes. In a medium bowl or jar, combine all remaining ingredients except raisins. Mix thoroughly. Stir in chilled oats. Top with chopped raisins. HG Tip: If you like to plan ahead, make a large batch of the plain oatmeal in advance. Just bring 5 cups of water to a boil in a medium-large pot. Add 1 cup steel-cut oats and 1/8 tsp. salt, and return to a boil. Reduce to a low simmer. Cover and cook for 1 hour, or until thickened. Makes 8 servings (about 1/2 cup each). Apple pie a la mode is delicious, but it's not exactly the healthiest way to start the day. Enjoy the flavors you love in this nutritious a.m. meal! Reduce to a low simmer. Cover and cook for 20 minutes. Stir in chopped apple. Re-cover, and cook until oats have thickened and apple has softened, about 10 minutes. Let cool completely. Refrigerate until chilled, at least 45 minutes. In a medium bowl or jar, combine all remaining ingredients. Mix thoroughly. Hungry for More Oats 'n Yogurt Recipes? There's still time to celebrate National Popcorn Poppin' Month, a.k.a. October. Do it in style with these Candy Corn Popcorn Balls! Your pals need crazy-good breakfast recipes like these -- click "Send to a Friend," why dontcha?